This hands-on tutorial, filled with exercises and examples, introduces the reader to a variety of concepts within Pentaho Reporting. With screenshots that show you how reports look at design time as well as how they should look when rendered as PDF, Excel, or HTML, this book also contains complete example source code that you can copy and paste into your environment to get up and running quickly. 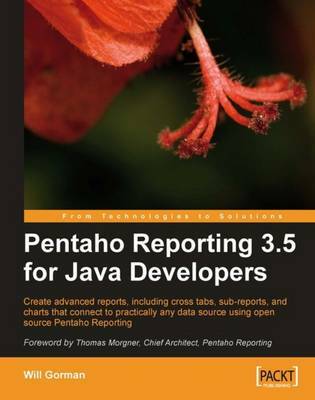 This book is primarily written for Java developers who want to assemble custom reporting solutions with Pentaho Reporting. Their main interest is in the technical details of creating reports and they want to see how to solve common report problems with a minimum of fuss; they do not need an overview of BI or the importance of reporting. Secondary audiences of this book are IT professionals who need to install a reporting solution in their environment, and want to learn advanced concepts within Pentaho Reporting such as sub-reports, cross-tabs, data source configuration, and metadata-based reporting.